This morning I had a dream. 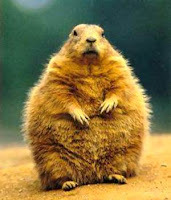 It was right after I heard the outcome of Phil the Groundhog's winter prediction. In this dream the mafia had decided that they were through with the cold bleak winter months, so they decided to do something about it. They snuck into the burrow, and held Phil hostage until February 3rd, that way he couldn't see his shadow even if he wanted to. Thus leaving the winter to stay or leave up to it's own discretion. What a great dream. If only. Right about now I am hating Phil. This winter has already been an eternity, and now because of our little fury friend it is going to last six more weeks. Who had the bright idea to leave the fate of the weather up to a little hibernating rat who just wants some more sleeping time? Normally I love winter. I love the crystal shimmer that the snow casts all around, I love winter sports, I love the coziness of the house and warm cookies, and hot soup... but I have cabin fever worse than I have ever had it. I am greatly anticipating the summer. I cannot wait for the heat, the Popsicles, the cold water, and the fresh garden food... I am so excited for all of the things that I am missing. I wouldn't mind terribly if dear little Phil had a run in with the mafia who convinced our furry weather forecaster to change his mind. Okay, not really. I am just upset about the prospect of six more weeks of cold weather. But looking on the bright side of things, it has been warming up lately, and no matter what the German tradition is, a groundhog can't really predict the weather, and March is generally a month of Spring, so it isn't a big deal. We will see green grass peeking it's head up through the snow soon enough. I just had to vent for a second is all. Bring on the Spring! Very funny! You are such a great writer, Amy.